UPDATE: CoHealth App is now available for CMH's Medicine, Surgery and Birthing programs. Download this free app today from Apple's App Store or Google Play! 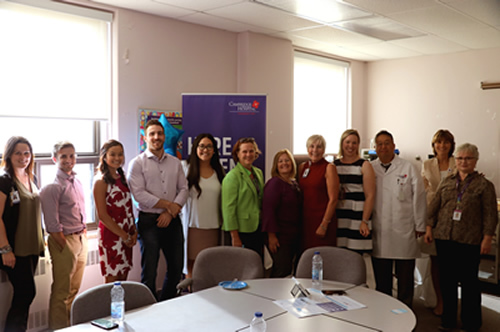 Cambridge, Ontario – Cambridge Memorial Hospital is proud to announce the launch of a patient information app in the Women and Children’s Program. Developed by CoHealth (formerly DashMD), the phone app improves access to high quality after care information, empowering patients to be more active, informed and engaged partners with their healthcare team. CoHealth was established when one of its founders developed complications after leaving the hospital. Although he received aftercare instructions, he was unable to recall all of them once he returned home. CoHealth was developed in part, to prevent this from happening to other patients. Patients can download the app on their mobile devices and be able to access detailed instructions related to their specific healthcare needs, including the management of side effects and symptoms to monitor. It can also be used to manage appointments with their healthcare team and remind them to take medications. Cambridge Memorial Hospital traces its roots to 1888, when the region’s first community hospital, known as Galt Hospital, opened its doors to treat patients in a localized health care setting. In 1953, the hospital was built on its present location, which was better suited to serve the major communities of Galt, Hespeler, Preston and the Township of North Dumfries. It was named South Waterloo Memorial Hospital, in honour of those who gave their lives for the community and country. As local boundaries changed and communities merged, the hospital adopted the new name of Cambridge Memorial Hospital. Today, Cambridge Memorial Hospital has over 1,100 dedicated and skilled health care professionals, technicians and staff, 280 physicians and 400 volunteers who provide excellent care to the residents of Cambridge, the township of North Dumfries and the Region of Waterloo. For more information, visit www.cmh.org.